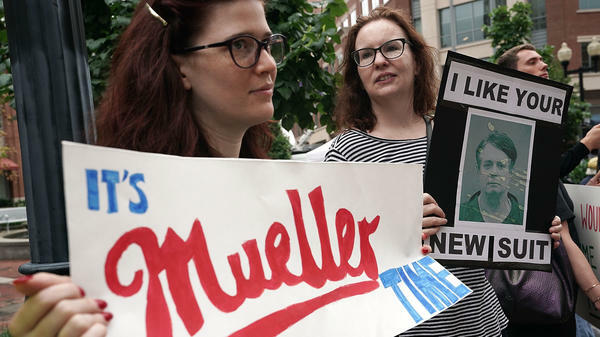 Activists hold signs — one referencing special counsel Robert Mueller — outside the Alexandria, Va., courthouse as Manafort's trial began this week. Rick Gates, a former associate of Paul Manafort, leaves the federal courthouse in Washington, D.C., after a February hearing. He is expected to be the government's star witness at the Manafort trial in Virginia. Paul Manafort's attorney told jurors: "We're primarily here because of one man — Rick Gates." President Trump asked his attorney general to stop Robert Mueller's special counsel investigation Wednesday morning, as the first trial stemming from that investigation entered its second day. 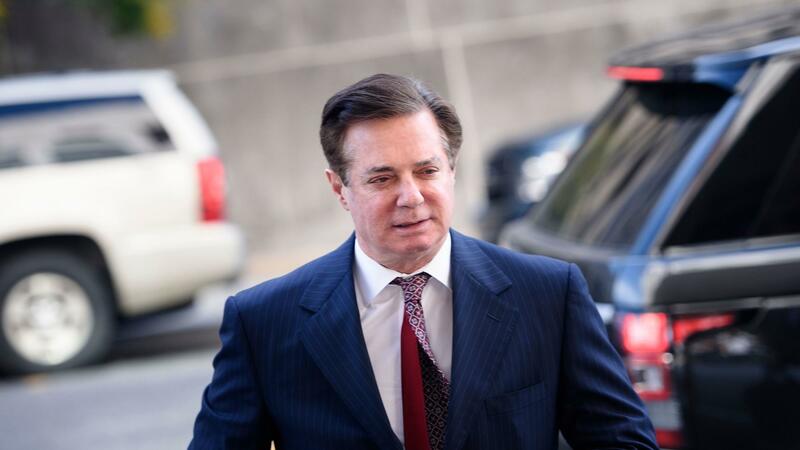 Paul Manafort, Trump's former campaign chairman, is on trial in Alexandria, Va., for bank and tax fraud charges, not, as Trump noted in a Twitter thread Wednesday morning, for "collusion." "[Manafort] worked for me for a very short time. Why didn't government tell me that he was under investigation," Trump wrote. "These old charges have nothing to do with Collusion - a Hoax!" Trump called the Mueller investigation a "terrible situation" and said Attorney General Jeff Sessions "should stop this Rigged Witch Hunt right now, before it continues to stain our country any further." Sessions recused himself early last year from all matters related to the Justice Department's investigation of Russian interference in the 2016 election and possible coordination with Trump campaign aides, because of his adviser role in Trump's campaign. Deputy Attorney General Rod Rosenstein has been overseeing Mueller's probe since the special counsel was appointed last summer, and he, too, has recently come under fire by conservative lawmakers in Congress. It's not the first time Trump has mentioned wanting to cut the Russia probe short. He reportedly ordered White House counsel Don McGahn to fire Mueller last summer, an order the president eventually walked back when McGahn threatened to quit. Mueller has been interested in whether Trump attempted to obstruct justice at any point since at least last June, and The New York Times reported last week that the special counsel's lawyers have told Trump's legal team that they are specifically examining Trump's tweets related to obstruction. White House press secretary Sarah Sanders was asked in Wednesday's press briefing about the tweet, and whether Trump wanted to "intervene" in Mueller's investigation. "It's not an order, it's the president's opinion," Sanders said. "The president has watched this process play out but he also wants to see it come to an end, as he's stated many times. We look forward to that happening." Trump's personal lawyers also downplayed the tweet, in comments to The Washington Post. "He carefully used the word, 'should,'" Rudy Giuliani noted. Another Trump lawyer Jay Sekulow added: "The president has issued no order or direction to the Department of Justice on this." "Looking back on history, who was treated worse, Alfonse Capone, legendary mob boss, killer and 'Public Enemy Number One,' or Paul Manafort, political operative & Reagan/Dole darling, now serving solitary confinement - although convicted of nothing?" Trump said. "Where is the Russian Collusion?" In court filings that described the circumstances of Manafort's earlier confinement at a different facility farther from Washington, D.C., prosecutors described Manafort's situation as "a private, self-contained living unit, which is larger than other inmates' units." In it, Manafort has "his own bathroom and shower facility, his own personal telephone, and his own workspace to prepare for trial." In monitored phone calls while at the Northern Neck Regional Jail in Warsaw, Va., Manafort had told others he is being treated like a "VIP," prosecutors said. On Wednesday, the second day of Manafort's trial opened with testimony from a political consultant who did work with Manafort in Ukraine, and an FBI agent who worked in counterintelligence, and closed with a number of men who sold Manafort luxury items like cars and expensive suits. The most shocking moment of the day though, was actually about who may not testify: Rick Gates. Gates, Manafort's former business partner, has agreed to cooperate with prosecutors; he was considered to be their star witness, as someone directly involved in Manafort's business dealings. 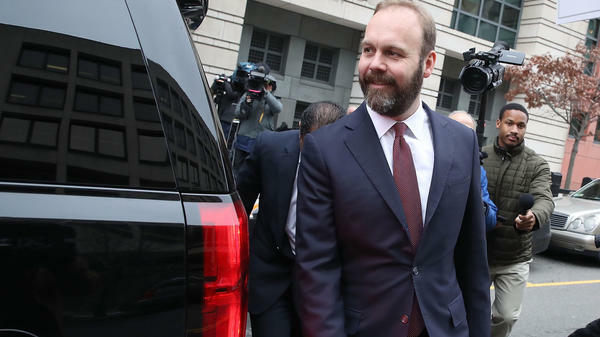 Defense attorney Thomas Zehnle took aim at Gates in his opening statement Tuesday, saying Gates embezzled money and was lying to prosecutors to put the blame squarely on Manafort, setting up a credibility battle that seemed sure to culminate in Gates' testimony. Assistant U.S. Attorney Uzo Asonye however, said Wednesday that Gates "may testify, he may not." Asonye said he didn't have a reason for couching Gates' testimony that way, noting that prosecutors are constantly re-evaluating their witness list, and cautioning everyone still in the room not to read too much into his statement. "[Manafort] demanded a lot of people who worked for him," Rabin said. "He was thorough, he was strict." FBI agent Mikuska was part of the team that executed the search warrant on Manafort's condo in Alexandria. During his testimony, more details were revealed about the search: the FBI did not have a "no-knock" warrant, as was previously reported by some outlets, allowing them to break into the property, Mikuska said. They knocked, and when they received no reply, they entered using a key. Despite the tweetstorm President Trump was rustling up online, for the second day in a row so far, there was no mention of Russian interference in the courtroom. There was, however, an interesting moment between the judge and attorneys, when Judge Ellis asked the prosecution to refrain from using the word "oligarch" to describe who was paying Manafort for his Ukrainian lobbying work. The word, he said, has a negative connotation and could bias jurors. His request wasn't made in front of the jury. "We're not going to have a case tried where [Manafort] is associated with despicable people, so he is despicable," Ellis said. "That's not the American way." Prosecutors did, however, work again to paint Manafort as a man with expensive taste, who paid for things in unorthodox ways. A parade of witnesses was brought to the stand — people who sold luxury cars, houses and expensive custom suits — and asked how Manafort paid for the items he bought. They all said international wire transfer, from banks abroad. "He was the only one who did that," said Maximillian Katzman, of the luxury men's wear boutique Alan Couture. The witnesses were also asked by prosecutors whether they ever dealt with Rick Gates, and all but one said no. Thursday's testimony promises to be more of the same, with a number of bookkeepers, accountants and tax preparers scheduled to testify. Prosecutors said Wednesday, that because of the pace they're working on, they expect to close their case ahead of schedule next week. The trial's opening day, on Tuesday, was a blur: The jury was seated, both sides presented their opening statements and the government's first witness took the stand. Judge T.S. Ellis III said before the trial began that he wanted the proceedings to wrap in three weeks or less, and Tuesday's proceedings lived up to the Alexandria, Va., courthouse's reputation as a "rocket docket." Manafort's trial on bank and tax fraud charges is the first to stem from Mueller's investigation. Manafort used the money he allegedly shielded from authorities to buy multi-million-dollar properties, antique rugs and luxury cars, Asonye said. In one case, Manafort even purchased a $15,000 jacket "made from an ostrich." Asonye said Manafort didn't just lie to the Internal Revenue Service, he also lied to his own bookkeepers to avoid paying taxes and to banks in an effort to qualify for loans he wouldn't otherwise have been approved for. "All of this was willful," Asonye said. "Paul Manafort knew about the law." Manafort's lawyers presented a very different picture. Gates was indicted the same time as Manafort and initially fought the charges. But he pleaded guilty in February and has been cooperating with the special counsel's office. He is expected to be the government's star witness. Zehnle placed the blame for Manafort's current troubles on Gates' shoulders. "We're primarily here because of one man — Rick Gates," Zehnle said. He said Gates took advantage of his position overseeing day-to-day operations of Manafort's consulting firm. He accused him of embezzling millions of dollars and manipulating transactions to "line his own pockets." Gates' guilty plea, in Zehnle's telling, is nothing more than an attempt by Gates to save his own skin. The government's first witness on Tuesday was Tad Devine, a political consultant who has done work for the presidential campaigns of Bernie Sanders and Democratic nominees Al Gore and John Kerry. Devine also worked closely with Manafort on consulting work in Ukraine. Under government questioning, Devine described Manafort as very much the hands-on boss in their Ukraine work, testifying that "Paul was in charge" of business operations. "It was a tremendous amount of work, and I have to say, Paul worked harder than anyone," Devine said. "There were emails sometimes throughout the night." In releasing the jurors on Tuesday, Ellis warned them against watching the news or talking to family about the case, even though there was sure to be "intense curiosity" about it. He also told them not to read, watch or listen to any news reports about the trial. He urged them, in closing, to "keep an open mind."